1. Try to stay relaxed, it’s easier said than done! If you’re tense while running, you’ll feel it the next day. Start with a good dynamic warm-up so your body is warm, relaxed & ready to go! 2. Regularly glance down at your running surface & pick the clearest path. Avoid painted lines and seek out pavement over cement, it tends to have a little better traction. If it’s really slick out, a dirt path may be your best option. 3. 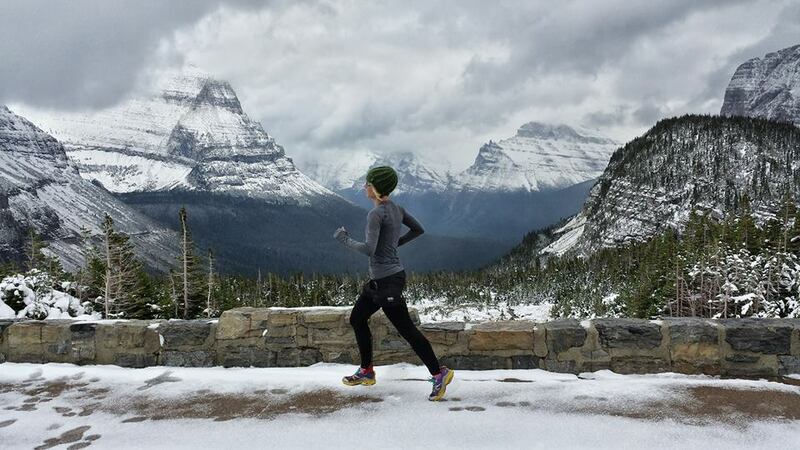 When running on ice, shorten your stride. Think: quick, light steps! Shortening your stride will ensure that you land under your body, the best position for good balance. 4. Resist the urge to lean back, stand tall with good posture. Again, this will help you land under your center of mass & improve balance. 5. Land on your midfoot or flat-footed. Shortening your stride will encourage you to land on your midfoot. Your midfoot provides more surface area & better balance than landing on your heel. You may notice that you slip more walking, than running, that’s because walking uses a heel strike. 6. Think about lifting your legs with your glutes, rather than pushing off with your toes. Pushing will cause you to slip. 7. Use your arms for balance, airplane them out to your sides if you need a little extra help. 8. Finally, if you have trail shoes, use them, they have more tread than traditional running shoes & provide better traction. Stay safe & enjoy the frosty landscape around you!